If you have a locked iPhone, we have different methods that entail how to unlock iPhone with IMEI code. Apart from this, we have two separate unlocking methods which usually confuse a good number of people. These methods are Sim Unlock and iCloud activation lock bypass. The difference between the two is that the Sim unlock method involves unlocking the sim lock while the iCloud activation revolves around unlocking the automatic iCloud activation security feature. If you want to know how to unlock iPhone with IMEI code, I have with me two different methods that will unlock your locked iPhone in a span of days as long as you follow the required steps. Each and every phone comes with a unique 15 digit code that differentiates it from other devices. This unique code acts as determinant or a tracking number when you happen to lose your phone. 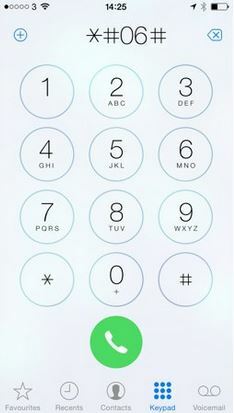 For those with iPhones, you can retrieve this unique number in different ways. The following are some of them. This is the primary method of checking your IMEI code on almost all devices. On your dial pad, dial *#06# and press the call icon. Your unique code will be displayed immediately. 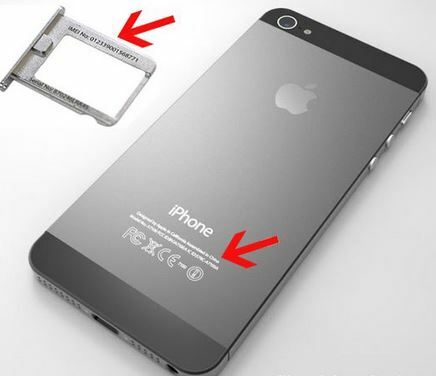 Another way of retrieving your IMEI code is by removing your Sim Card tray. 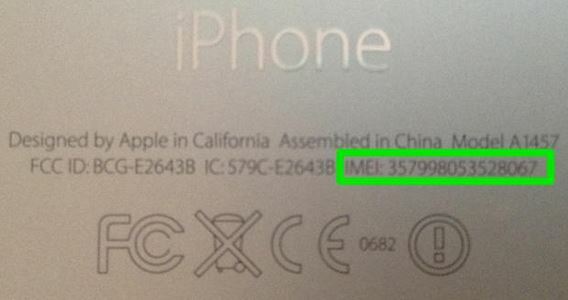 In most devices especially iPhone 4, this number is usually located on the Sim tray. If you are operating on an iPhone 5, 5C, SE, 6 or 6S, you can retrieve your unique code at the back of your iPhone. DoctorSIM Unlock Service give you the freedom to unlock your previously locked iPhone and render it useable for different network providers. dr.fone guarantees you hustle free sim unlocking services, something that can’t be said of other sim unlocking services. 3 steps to unlock iPhone SIM Card with IMEI Code. If you have a locked iPhone 7 and you want to unlock it, this is a detailed method on how to unlock iPhone 7 via its IMEI number using dr.fone Sim Unlocking services. Visit the official dr.fone Sim unlocking website and select your phone brand from the long list of brands supported by the unlocking service. You will be in a position to see the screenshot below. A new web page will open up. From this new web page, scroll down the page and enter your phone model, country of origin and your network provider. Once you are done, the amount of money to be charged for the services will be displayed on your right-hand side. Scroll down the page and enter your iPhone 7 IMEI number as well as your email address. Check the box next to the “T&Cs” and click on the "Add to Cart” option. Once you have made your payment, the code to unlock your iPhone 7 will be generated within a period of 1-2 business days. You will be notified via email once this code has been generated. When you get this email, switch Sim cards and enter a new one from a different carrier. When prompted to enter a code, enter the one that was sent to you. As simple as it is, that’s how you can unlock iPhone 7 using its IMEI number. It’s no secret that the iCloud Activation Lock will bar you from accessing your iPhone and its features up until the lock has been removed. 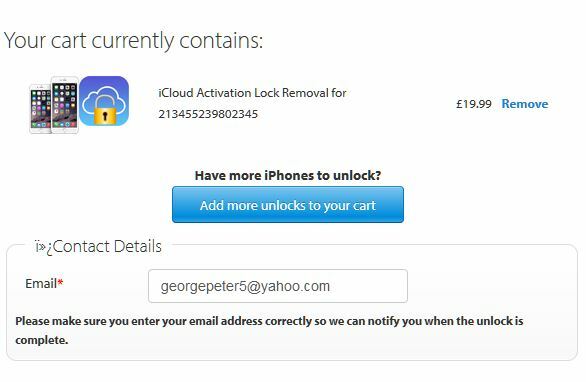 If you want to bypass this lock, you can use an online method such as the officialiphoneunlock.co.uk. With this online method, you only need to follow simple steps to bypass this lock and use your iPhone with no restrictions at all. If you have a locked iPhone 6, this is how to unlock iPhone 6 IMEI using the Official iPhoneUnlock method. For you to unlock your iCloud locked iPhone 6, the first thing you need to do is to visit the Official iPhoneUnlock website. On your left-hand side of the site, locate the "iCloud Unlock" option as shown in the screenshot below. Click on this option to launch a new web page. On your new web page, scroll down and locate the “Device Details” option. 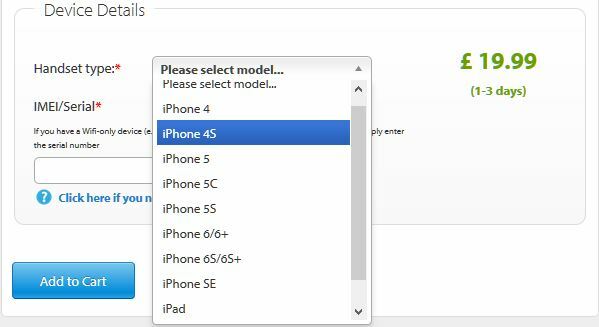 Under this option, enter your handset type (iPhone 6) as well as your IMEI number in the spaces provided. Once you have entered the details, click the “Add to Cart” option. On your new web page, you will be prompted to enter your email address. Make sure that the email address provided is genuine and active since it will be used as a communication channel between you and the company. Click on the “Continue” icon to proceed. A new page with your payment option will open up. Click on the “Pay with Credit or Debit Card” and choose your best-preferred payment method in the next web page. Pay the amount required and agree to the terms and conditions and click on the “Make Payment” option on your right-hand side. Once you have made the payment, a confirmation email will be sent to your designated address. All you have to do now is to wait for about 1-2 business days for the lock to be bypassed. Upon successful bypassing, you will receive an email informing you that the activation lock has been removed. All you have to do now is to switch ON your iPhone 6 and use it freely with no restrictions whatsoever. From the information gathered in this article, we can comfortably state that it’s easy to unlock your iPhone regardless of the model you are using. Whether you want to know how to unlock iPhone with IMEI code or to simply know how to unlock iPhone 5 using IMEI code, the methods mentioned above will no doubt see you through each and every step when unlocking your iPhone. Looking to unlock sim on iPhone? Here is a sure shot way to do it that will make things easy for you. This article describes how to unlock Verizon iPhone online without a SIM Card, or how to unlock iPhone 5 Verizon with the help of Verizon itself. This article describes how to unlock AT&T phone be it iOS or Android.